This is a 32 ounce bottle of ProTek R/C "TruWash" RC Car Wash. ProTek R/C understands that how your ride looks is as important as how well it performs. We all want to shine, but a clean car is not all about showing off; dirt and grime can slow a car down, kill bearings and lower overall performance. Sometimes running at your peak can just be a wash away. The ProTek R/C TruWash RC Car Wash is a product that can be used with all types of RC vehicles. Mud, dirt, grease, sand, spots, tough stains and general grime can now be easily washed away without any brushing or scrubbing required. 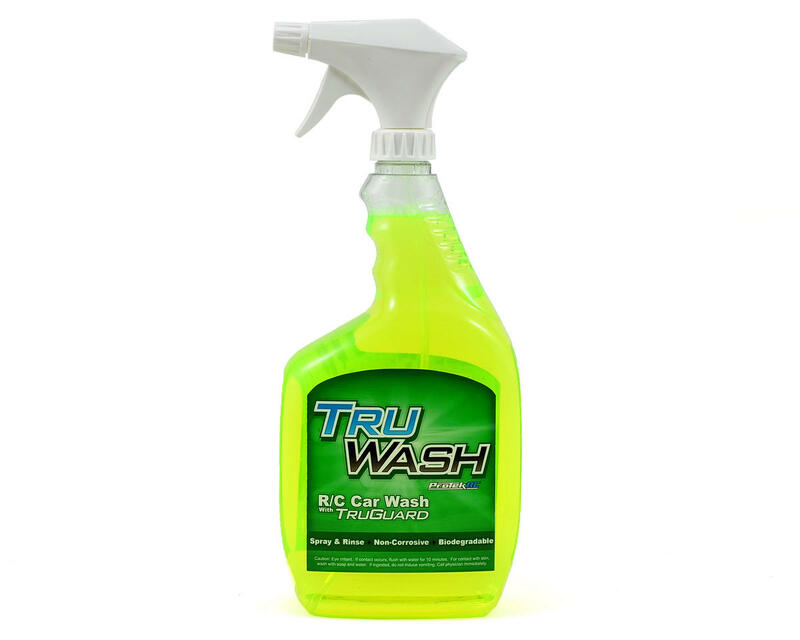 The RC Car Wash formula includes "TruGuard" protectant which provides a shielding agent that allows mud and other debris to be easily removed on your next wash. Use TruWash with water as a rinse or you can just blow it off with air. TruWash is environmentally friendly, readily biodegradable, phosphate free, non-corrosive and non-chalking. It will not attack plastics, anodized or aluminum parts. It is safe on all RC car surfaces and will not leave your RC car body looking dried out. It will not make plastics brittle or cause cracking. Clean RC vehicle after allowing time to cool. Rinse RC vehicle of heavy mud and debris. Spray TruWash over entire vehicle. Allow TruWash to penetrate for 2 to 5 minutes. Rinse RC vehicle or wipe with a damp rag completely. Note: TruWash RC Car Wash is not intended for use electric motors! I have a bottle at work and at home. Perfect for wiping off the bike and has a little something in it to keep the dirt from immediately coming back on. I use this on my road bike, MTB, kids BMX, and our Dirt Bikes. Was very impressed with the product. Like simple green only a little milder, which is a good thing. it work really good cleans the parts to look like new.